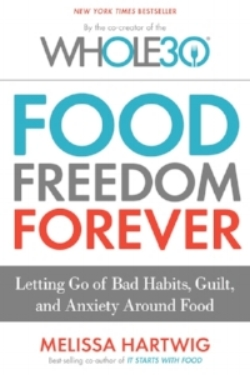 Just in time for New Year's resolutions, Melissa Hartwig's FOOD FREEDOM FOREVER has landed in the UK! What does 'food freedom' mean to you? Bestselling author and nutritionist Melissa Hartwig defines true food freedom as being in control of the food you eat, instead of food controlling you. It means indulging when you decide it's worth it, savouring the experience without guilt or shame, and the returning to your healthy habits. If you're new to Melissa's genius approach to healthy eating, the bestselling WHOLE30 is a tried-and-proven, step-by-step plan to help people rethink their eating habits, reshape their bodies, and reinvigorate their lives that has sold over 500,000 copies and changed lives around the world. It's also only .99p on Kindle until January 15th!